A sunroom also referred to as sun parlor or sun lounge, makes us imagine a light-filled room to enjoy sunny days and to keep plants happy and warm. Adding a sunroom would not only make your house more attractive but also adds space, value, and a good amount of sunshine into your home. 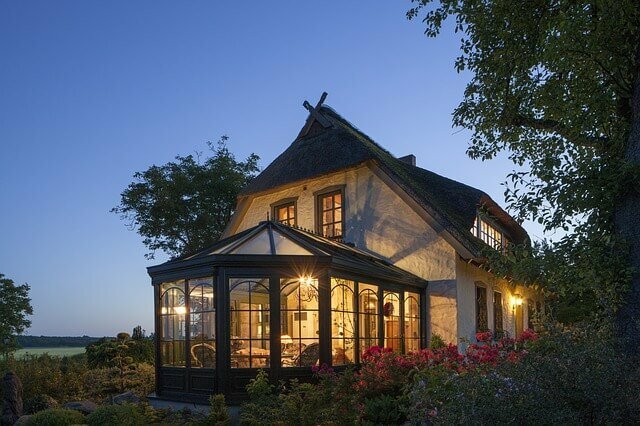 Let us explore the various types, benefits, and costs of sunroom addition. Depending on the lifestyle, preferences, and budget, one can choose from a variety of sunroom types. A three season sunroom is usually used during the warmer months of the year. They are the most popular sunrooms and are usually enclosed in glass. This heated room can be used all year long. Closely related to the sunroom, this option is designed to be heated and cooled. As a result, it can be enjoyed year-round. Also called as conservatory is a seasonal room, it is a room with glass walls on all sides including the top. It can be accessed from the inside and is intended to serve as a living area, but can get very hot or cold during summer and winter. It’s a four season room designed for plants. An attached greenhouse structure offers light, temperature, and humidity levels that are designed for plants, not humans. This page about how to build your own greenhouse is very helpful. If you want to make the most of your porch area and enjoy the views irrespective of the weather conditions, you should consider porch enclosures. The porch enclosure can be screen or glass. Instead of having glass or walls, if it is covered in mesh, it offers the advantage of fresh air without insects. It is enjoyable only when the weather is nice of course. For more information on the features for each of the sunroom types, check the comprehensive comparison guide by Patio Enclosures. Understanding the components that go into a seasonal room will help you select the type of room you want. Vinyl is one of the most popular materials used for the supports. It is cheap, requires minimal upkeep, and provides great strength and insulation. It is available mainly in white. Aluminum is more expensive as vinyl, and not as good an insulator. Wood is a pricey option, but is also a more appropriate choice for screen rooms, easily allowing you to attach the screen mesh to the timbers. Wood does need some maintenance once in a while. Glass walls should be silicone double-sealed, A-rated, and labeled “tempered safety” to meet building code requirements. Sunrooms of standard materials start at $15,000. Top-of-the-line aluminum and glass sunrooms topping out at $22,000. Of course, prices will vary by design, materials, your region, and the amount of work you’ll do yourself. Construction costs of four-season rooms will vary, too, according to heating and cooling demands and finish details. Expect to pay at least $20,000 for a finished room. Screened porches are a comfortable option for a far lower price tag. You can get the results you want for $5,000 to $10,000. Simple and clean sunroom to refresh and relax. Go green with your sunrooms. If you want a room with all the above-mentioned benefits, it is about time you consider adding a sunroom to enjoy the beauty of nature while enjoying the shelter of your home. It’s interesting how you point out that depending on the lifestyle, preferences, and budget, you can choose from a variety of sunroom types. I didn’t realize that there were more than one type of sunroom. My husband loves natural light, and I think he would like having an extra room in our home where he can sit and enjoy the warmth of the sun. We’ll have to talk with a professional to learn more about the different benefits of the different types of rooms. As a contractor, I am curious how and in which region of the country (assuming USA) you would add a screened-in porch for as little as $5000? That doesn’t come close to the cost of materials, properly tying into a roof line or site work/foundation considerations. Content like this makes it very hard for experienced tradespeople to bid projects that will accurately meet client’s needs and set realistic budgets. I thought that it was really interesting how the article said that a sunroom is a room that is light-filled so you can enjoy sunny days and keep plants happy and warm. My wife has been wanting to start growing plumeria plants in our home, but we do not have anywhere that has enough access to the sun to keep them nourished. It may be good for us to consult a company that can install a sunroom onto our house. Thanks for the suggestion to have a four-season sunroom addition in my house. I will greatly consider the materials used so that it will be eco-friendly. Personally, I believe that the cost to have one done by a professional is worth it since I’ll get to e joy nature without living outside so I’ll look for someone to build me one next month.